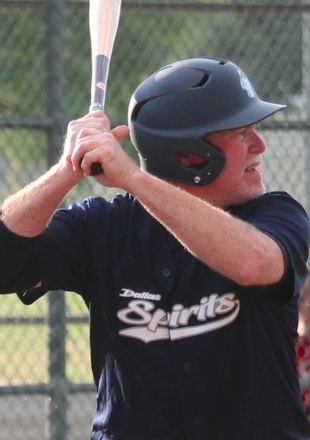 (April 3, 2019 – Grapevine, TX) Those winnings ways the Spirits (40+) are used to is slowly becoming a rear-view mirror ideology as the squad dropped another game this past Wednesday night in DFW-ABA League play at Oak Grove Park. In a blink of an eye, the team was trailing, 4 to 0 in the first inning and after the second inning, the game was nearly out of reach as the Fighting Chihuahuas exploded for another 3 runs to obtain a commanding 7 to 0 lead against the shell-shocked ghosts. 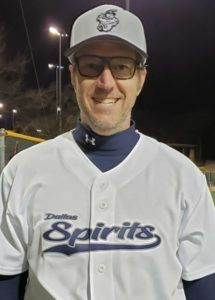 The starting pitcher for the dogs showed some solid control as he coasted with 4 strikeouts in just the first two against against the top half of the Spirits order. There were signs of life however, as the Spirits finally stopped the bleeding when Kirk Sipila replaced starter, Earl German at pitcher and was able to get Raymond Ayala on strikes and Harry Blust to ground out with runners on second and third. Once the dust settled, German was responsible for 7 runs, 4 earned, 3 walks, 2 strikeouts and the bad end of two Spirits fielding errors that did nothing to assist a tough start, finishing with just an inning and a third of work. Those signs of life carried over to the offensive side for the Spirits as Brant Finchum started the top half of the third with a 7-pitch single. 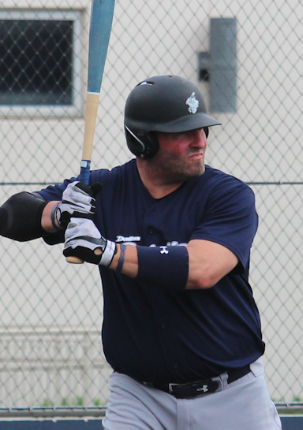 Finchum was able to reach second on an error by the dogs after Jack Nash lined out before leaving the batter’s box and the third baseman erroneously attempted to throw out Finchum. Finchum took third on a wild pitch and David Tipton drew a walk to put two on with one out. A balk moved Tipton over and allowed Finchum to score and a moment later, a double by Stacy Scott gave the Spirits their second run as Tipton was able to score easily. German also drew a walk and an RBI single by Sipila cut the lead down to 7 to 3. Travis Hitzman went down on strikes, but Patrick Bilgere kept the scoring alive with an RBI single to cut the lead to 3. Shawn Lee beat out an infield single that was good to score Sipila and before Eric McPherson flew out to end the inning, the Spirits had cut the score down to, 7 to 5. Things remained fairly quiet the rest of the way as both pitchers seemed to settle in and each team’s defense played well. The Spirits made a little noise in the top half of the fifth after German and Sipila each singled with one out, however Hitzman flew out and the Chihuahuas pitcher was able to retire Bilgere on strikes to kill the rally. Despite retiring the Chihuahuas quickly in the fifth to force another inning, the team was greeted with drama as the Chichuahuas complained that the game should end despite the fact there was still time remaining based on the league’s time constraints. After the umpires calmed down their friends on the opposing squad, the Spirits were granted another at-bat as historical baseball rules would expect, however Lee was greeted with a chin-high strike zone to lead things off and eventually went down on swings. McPherson flew out, but John Hefner and Finchum followed with back-to-back singles to give the Spirits a pulse, but Nash became Holzer’s ninth victim at the plate after swinging at strike three to end the game. Sipila led all hitters with a pair of hits, a run scored and an RBI, while Finchum also finished the night with a pair of hits and a run scored. Sipila completed three and two thirds innings of pitching, allowing no runs, no hits, walked one, and struck out 6. The loss drops the squad’s record to 2-3 in DFW ABA play and 3-6 on the season when counting the team’s trip to Las Vegas in March. The squad will have a chance to rally and even things back to .500 with plenty of games to play as they visit the Otters next Wednesday night on Arlington field at the Texas Star Complex in Euless. Click here for schedule details. Be sure to also check out the Spirits (35+) squad as they finally get the opportunity to kickoff the NTABL season this Thursday night as they visit the Thunderbirds at First Baptist Academy in South Dallas starting at 9:00PM. Click here for those schedule details.